We are proud to have been awarded bronze Waste Wise certification in July 2011 from the Metropolitan Waste Management Group. This award recognises our commitment to ongoing improvement in sustainability practices in waste minimisation and resource efficiency. Our new Gaia food waste machine was installed early 2017 and recycles all our fish offal (79 tonnes) and green organic waste (190 tonnes), turning it into a rich garden food via a dehydration process. Around 700 litres of water is evaporated from the green waste during the dehydration process which is captured and then diverted to our harvested water system where it is then used to flush toilets in the public bathrooms. In the past year, Prahran Market Traders donate 23 tonnes of fresh food to SecondBite, which would have instead gone too landfill. 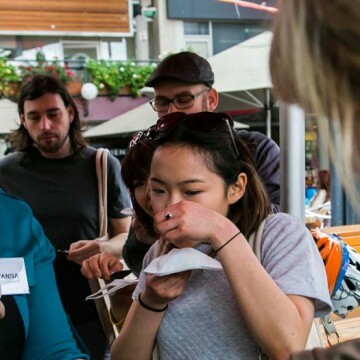 SecondBite collects the food and redistributes it to 70 agencies (including local agencies, Prahran Mission, The Prahran Adventure Playground and Sacred Heart Mission) and thousands of people who are homeless or living in disadvantaged circumstances. The food donated by Prahran Market traders is enough for 74,000 – 500g nutritious meals a year.The Prahran Market Traders have been instrumental in this story. Prahran Market was the first Melbourne Market to donate fresh food to SecondBite. Water usage reduced from 45 mega litres (2005/06) to 20 mega litres (2015/16) which equates roughly to 401 domestic sized swimming pools saved annually. Water reduction has been achieved by: the installation of pressure reducing valves trader education sessions, the installation of sub meters in each tenancy so they can monitor their usage, rain harvesting systems (70,000 litre capacity) toilet upgrades – including water efficient pans, urinals and tapware, locating and repairing underground leaks, improved cleaning techniques, trigger nozzles and water monitoring systems. Chicken, fat and bone – roughly 323.5 tonnes is taken off-site annually for processing. It is then used in animal foods or pressed for oils etc. Two hundred and twelve tonnes of Cardboard is recycled annually. This is then recycled into other products. We also recycle our office paper and air-conditioning filters and printer cartridges. One hundred per cent of our polystyrene (approximately 22.1 tonnes) is collected and recycled into building materials. Around 12,000 litres of our traders’ used cooking oil is recycled and processed into bio-fuels. 25% reduction in power usage. Installation of time clocks, sensors and energy saving lamps throughout the site. We have reduced our peak demand usage from 315Kw to 241Kw. Major upgrades to our boiler system has resulted in a major reduction to our gas usage. The new boiler system is far more efficient and produces less emissions. We have also upgraded the gas heaters in the fruit and vegetable hall to more efficient units. Connecting the rain harvested water to service toilets and urinals in public bathrooms has reduced overall water consumption. Investigating options like solar hot water, solar power energy and Voltage Power Optimisation (VPO) technology.